Sleep in comfort with AeroBed Classic Double High Airbed. It offers perfect relaxation with 32 coils support sleepers that comforts you throughout the night. The double-high design makes getting in and out of bed easier. 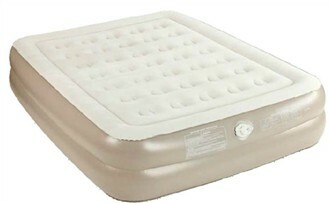 The Queen size AeroBed airbed comes with a hand-held AC pump that inflates the mattress. When not in use or you are ready to pack it up again, the Whoosh Valve helps deflate the bed in a minute. Mattress Dimension: 78" x 60" x 14"
The Aerobed Queen Size Double High 2000024489 / 2000031082 has many exciting features for users of all types. See the Aerobed Queen Size Double High 2000024489 / 2000031082 gallery images above for more product views. The Aerobed Queen Size Double High 2000024489 / 2000031082 is sold as a Brand New Unopened Item.